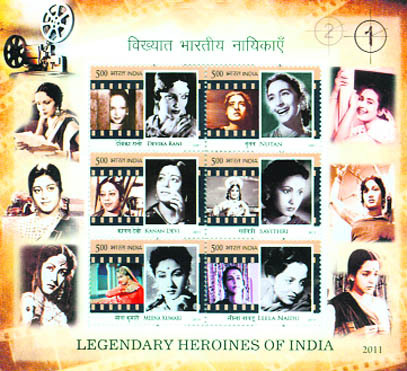 DURING the World Philatelic Exhibition held in Delhi recently, the Department of Posts & Telegraph issued a commemorative Rs 5 stamp on Devika Rani, Nutan, Leela Naidu, Meena Kumari, Kanan Devi and Savitri, as a tribute to these icons for their role in changing the depiction of women on the screen. In Himanshu Rai’s Karma (1933), Devika Rani drew gasps of approbation. Achhut Kanya (1936) was the story of a Brahmin boy Ashok Kumar and Devika Rani, daughter of a Harijan railway crossing guard, trapped in a social milieu. The success of the film made Devika Rani the prima donna of films. In her debut film Hum Log (1950), Nutan was scoffed at for being skinny. Her projection of the turmoil of a tuberculosis patient in the film brought a lump to the throat. As a rebellious, juvenile, delinquent girl in a correction home in Seema, Nutan touched a chord. The bewildered expressions on her face in Sujata conveyed the predicament of an orphan Dalit girl. As Luxmi, a film actress exploited for her earning capacity in Sone Ki Chirya, Nutan slipped into the skin of the character. In Bandini, when Kalyani sees her lover — and sings, "Jogi jab se tu aaya more dware/more rang gaye sanjh sakare"— the joy on Nutan’s face mirrors the divine rapture of a devotee, who has seen God. Leela Naidu was the woman who put India on the international beauty map. When Hrishikesh Mukherjee cast her in the title role of Anuradha (1960), Leela lent a feminine sensibility to her character. Each expression was rationalised. In Sunil Dutt’s Yeh Rastey Hain Pyar Key — she played the straying wife of a naval officer with aplomb, looking ravishing in the role. However, it was her true-to-life portrayal of a young wife seeking her own identity in The Householder, which brought Leela international fame. She won critical acclaim for her portrayal of a Goan-Portugese grandmother — Dona Moria in Shyam Benegal’s Trikaal. Meena Kumari as Gauri won accolades in Vijay Bhatt’s Baiju Bawara for her captivating expressions singing "Tu Ganga ki mauj, main Jamuna ka dhara." As Sheetal, a young girl married to a man often mistaken for her father in Daera, she exuded despair. In Sharda, as Raj Kapoor’s beloved, who later becomes his stepmother, Meena Kumari set the screen ablaze. With her pleas in Dil Ek Mandir, her quivering timbre conveyed the predicament of a wife whose husband is suffering from cancer. In Sahib Bibi Aur Ghulam, what disturbs most is not the extinction of the feudal order, but the fact that a sensitive woman like Chhoti Bahu should be so ill-fated to be killed and buried simply because she had spoken to a man other than her husband. Meena Kumari spent her entire career depicting the grim tragedies that befall women. Her portrayals were a slice from her own life. Kanan Devi started her career as a child artiste and finally graduated to doing lead roles in films like Chaar Darwesh, Khooni Kaun. She had a captivating voice. Besides her acting assignments, she also started singing for the Megaphone Gramophone Company. In 1937, Kanan Devi joined New Theatres beginning with the film Mukti. It is Vidyapati, opposite Prithviraj Kapoor, which brought her recognition. While her acting got recognition, her voice, too, won accolades with numbers like "Ambava ki daali pey bole re koyaliya", "Door des ka rehne wala", "Ae chand chhup na jana", "Prabhuji tum raakho laaj hamaari" , with which her singing style, usually in rapid tempo, is identified.